Lisa and I were looking for something to do and we really wanted to get out with the Spitfire that has been knocking around in my gun cupboard for ages. We had just cleaned out the larder and were blessed with quite a selection of out of date tins. We agreed that it would make a rather good shooting gallery for the Spitfire. I wanted to get the gun set up for some ratting action so this would be a good chance to find the best ammo for it and get a solid zero. We set off with our out of date tinned food plinking gallery and made our way to the farm. For those of you that are not familiar with this incredible design, it fills from a port underneath the main action just in front of the trigger guard. You can fill from a dive bottle or a stirrup pump but one of the things that I love about the Spitfire is it's ability to fill from a buddy bottle in the field. Just top up the bottle and gun before you go out and you'll have around 100-120 shots from a single buddy bottle. Filling up in the field is easy, just screw in the buddy bottle until the gun is charged and you're ready for another 20-30 shots depending on version. 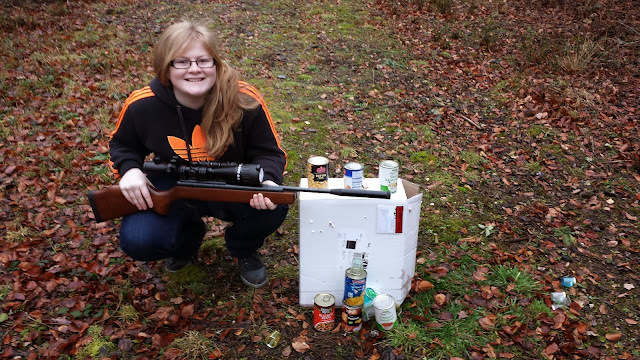 We tested Air Arms Diablo and H&N Baracuda Hunter Extreme's. 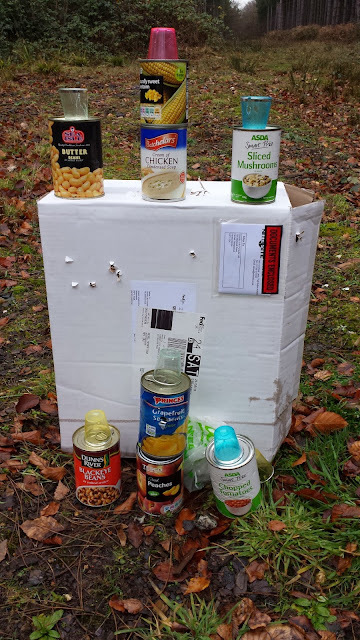 As you can see from the image below the Cuda's were devastating, going straight through a 4 year old can of Campbell's condensed chicken soup. 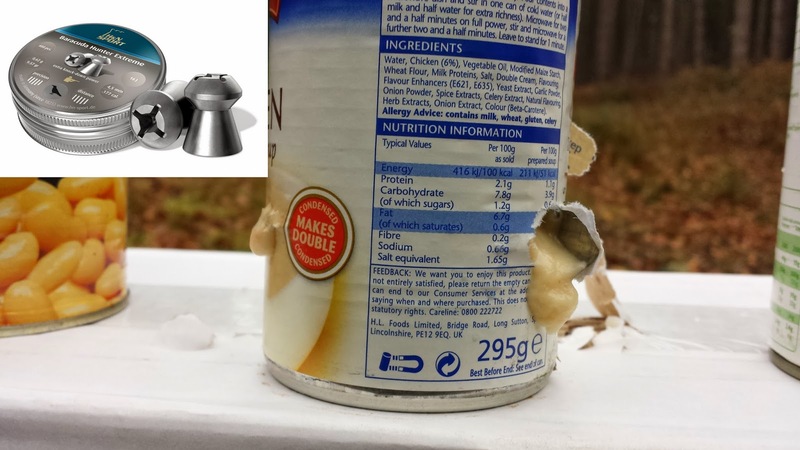 This shows just how well that pellet retains it's energy, pushing through the thick soup and penetrating the tin both sides really is quite impressive. The rifle runs consistently with the Cuda's at 11.5fpe so it's not like the gun was running hot. I can't wait to get out ratting with his gun now, it's super accurate and with the Cuda's the rat's won't stand a chance. I have an MTC Mamba and NiteSite NS200 up ready for our next outing. As you can see from the look on CPTV's Lisa's face this gun is great fun to shoot. Why on earth would they stop making it? Here is a fantastic read regarding the Spitfire from the man himself John Bowkett. The unique internal straight line valving in the Spitfire dates back to one of my 1980s designs. On Facebook there is a photo of a prototype complete with a slightly different anti-bounce mechanism that I made around 1990 while I was associated with Titan Developments. The production Spitfire was equipped with my S10 anti-bounce device but slightly modified. I will see if I can find the photo. The Spitfire went into production in 2000. The idea was to use S10 buddy bottles to top up the rifle. It would be a companion to the flagship but at the other end of the price scale using many components from the production springers but with S10 type barrel/rifling. The Spitfire working pressure is only 1900psi (approx. 130 bars). The buddy bottle is screwed directly into the socket in front of the trigger. No connectors or charging gear is required. The combined shot indicator/pressure relief valve cuts in when that pressure is reached. You cannot overfill the gun. The reservoir volume is small (approx. 50cc) so 2 or 3 full fills can be had from a buddy bottle. However, the secret of the Spitfires practicality is to be found in its shot indicator. The short 10” barrel carbine will give 25-30 shots per full fill and the 15” barrel rifle another ten or so. The procedure is as follows. Set a target at the maximum range you would use the rifle at - say 45 yards (40M). Give the rifle a full fill until the bleed valve cuts in at 2300psi. It will then slowly fizz down to 1900psi (130 bars) which is the maximum working pressure for the valving. At this point the post of the shot indicator will be at its uppermost limit. The post is in the middle of the pressure relief valve. Start shooting until your point of impact starts to drop on target. Note the position of the post a this stage. It has horizontal lines to help. As long as the post is above this level your shots will be constant. Topping up can be whenever you want. The 200cc bottle is small enough to be portable and there is no charging gear. After a couple of fills the bleed valve will not hiss because its pressure has dropped. This does not matter as long as the post is above the lower limit you previously noted you will get consistent shots but fewer of them per part fill. As an experiment I carried on topping up as many times as I could before there was no longer enough pressure to raise the indicator above its lower level. From the 15” barrel Spitfire I got almost 200 shots. Due to over enthusiastic use of a flapwheel the main sealing surface inside the air reservoir of the first batch of rifles was damaged. This caused a slow leak. Did they scrap the faulty components? No. The answer that BSA management had to the problem was to go ahead and launch the Spitfire with these faulty cylinders and state that the rifle was designed to hold a “transient charge”. It would hold air for 2-3 days. This was stated in the instruction leaflets that came with the Spitfire. Who wants to buy a pcp that leaks from new. Certainly gunshops would not touch them with a bargepole. NOTHING CHANGES DOES IT!!!!!! This effectively killed sales. Marketing reported in addition that in a gunshop it looked too much like a springer to attract attention. 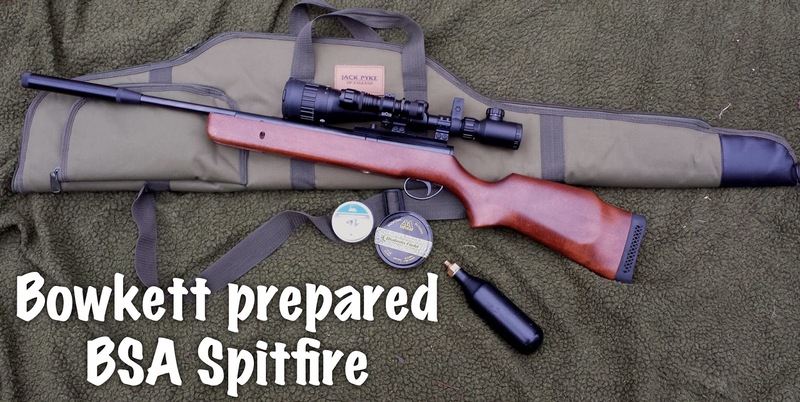 I bought a HF Spitfire for £70 it holds air for several days to a week its a bit of a task filling from a pump but for the few shot i take No problem. Its a touch heavy after using a spring gun for years but its neat design mor than compensates for that.